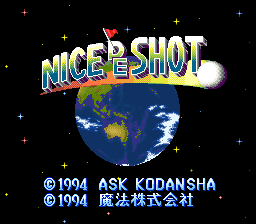 Nice de Shot is a golf game for the Super Nintendo. 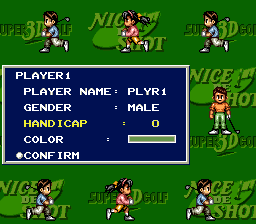 Here is a full English translation for the SNES golf title, Nice de Shot. 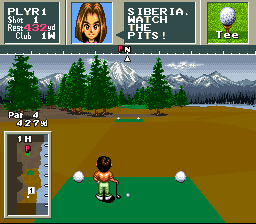 All the dialogues, menus, and lines have been fully translated making it easier now to navigate the game. MrRichard999 Hacking Modification of dialogue, menus, and other text. [J] Hacking Compression routines for inserting compressed text and title screen. Dr. 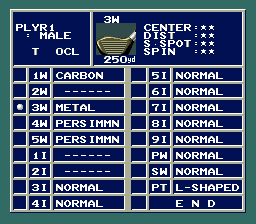 Floppy Hacking Helped with some of the menus that had compression. TheMajinZenki Translation Translation for the project. 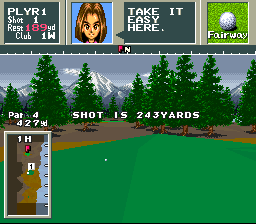 FlashPV Graphics Created new title screen and redrew the graphical text for tee off areas.